Did I mention that I love to decorate for fall? I do! Fall and December are the two seasons where I really go all out. 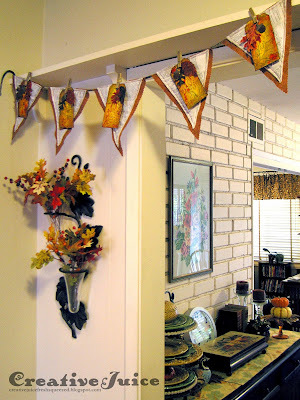 I have a shelf in my entryway that has been crying out for some sort of fall decor for a few years now. I finally got something done for that space, a fall-themed pennant banner! 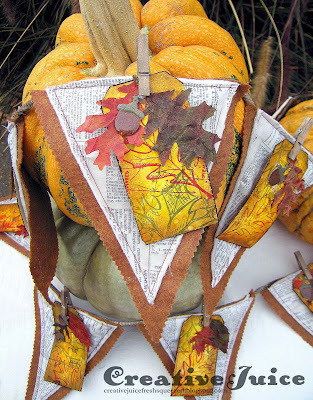 I wanted the softness and flexibility of a fabric base and I really wanted to use some of the new fabric that Tim Holtz has out now. I ended up layering triangles of felt, quilt batting and fabric so it would have some substance and dimension to it. 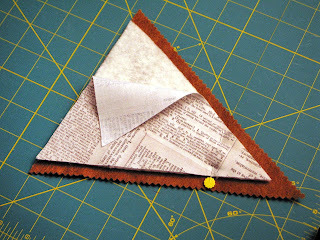 Pin it well, add a little top-stitching and you are in business! 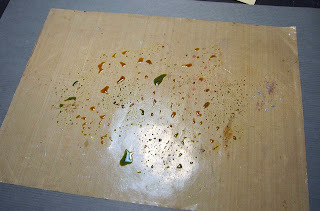 Dry it with a heat gun and you can blot it or swipe it through the stain still left on the sheet for another layer of color and texture. 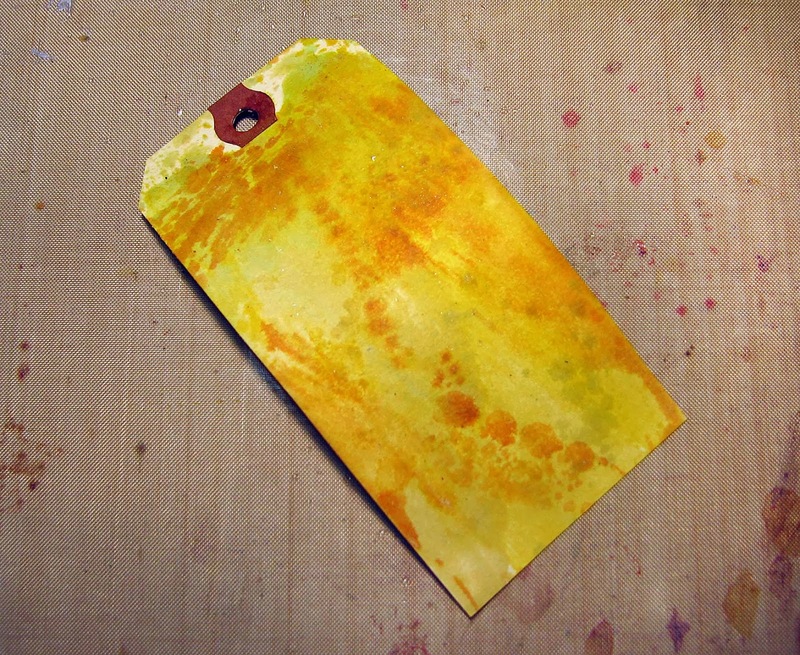 You can also flick water onto the tag and it will react with the stain, making spots. 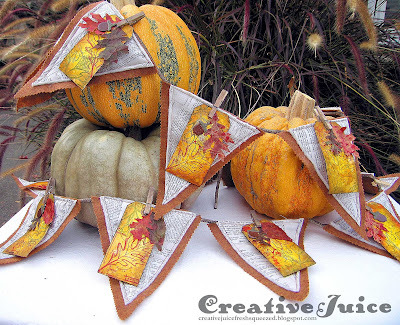 I then stamped it with the Autumn Blueprint stamps using some of the new Wendy Vecchi Archival Ink colors (see product list below). They are some really beautiful colors! After stamping, I blended Brushed Corduroy Distress ink around the tag and flicked it with water to make spots. 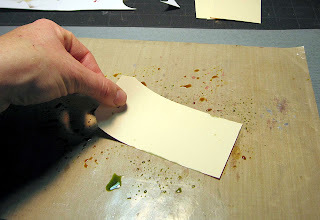 I also distressed the edges of the tag and inked them with Walnut Stain to define them. 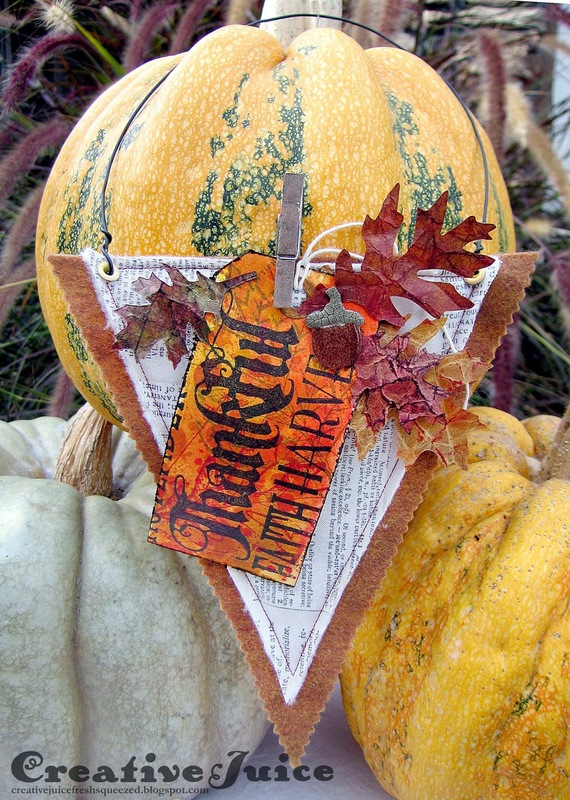 I embellished the tags with glassine leaves (see the link for Tim's tutorial, I did not use metallic mixatives on mine however). I also die cut acorns out of grungeboard. The caps I painted with Walnut Stain Crackle Paint and the other part is brown paint with a layer of Glossy Accents over it. Most of the supplies I used to create this card can be found at Inspiration Emporium. Follow the links below and use my code JUICE to save 10% if you go shopping. Thanks! Wow!!! This is so cool! :) Love it! Such a pretty decoration you made. Thank you for sharing and take time to make a tutorial as well.